We maintain contact with past Magma Structures projects and received this picture from the owner of SY Novara, a Dykstra designed 60ft sloop launched in 1996 that features two AeroRigs. 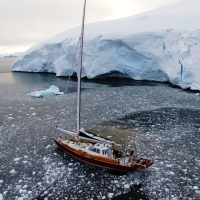 She is pictured left alongside Icebird, a similar AeroRig yacht. Over the years there have been over a hundred AeroRigs fitted to numerous sailing vessels, ranging up to 140ft in length. 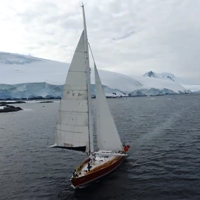 The team at Magma were responsible for the design and build of both the Novara and Icebird AeroRigs. The AeroRig has always been appealing to the explorers of the sea, due to its efficiency, ability to be handled easily and sail at high average speeds with minimal crew. This makes it the rig of choice for the difficult environmental conditions of both the Arctic and Southern Oceans. “As a freestanding rig the AeroRig does not rely on stays or rigging, which are often the cause of failure in conventional rigs. Built from high strength fatigue resistant carbon fibre, both of the AeroRigs on these vessels have the ability to self-unload by flexing, giving this type of rig the reputation of being practically indestructible.” Damon Roberts – Magma. The AeroRig is a trademark name for a free-standing rotating rig. Each of the AeroRigs on these vessels has a carbon mast and integral long boom extending fore and aft of the mast, on which both main and jib are set. In an Aerorig design the sails are always working correctly, whatever point of sail, ensuring that the rig works efficiently all of the time. The rotation of the rig is controlled by the mainsheet alone, and as the jib is located in front of the pivot point, it introduces a counterbalance force. This makes the mainsheet very lightly loaded when compared to the loads on other similar sized conventional rigged yachts. 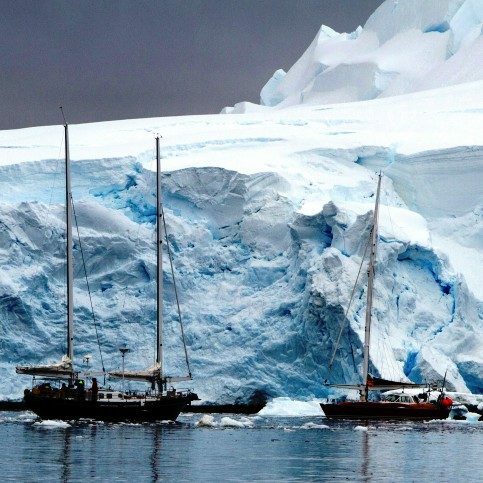 The AeroRig yachts Paratii and Paratii 2 have both circumnavigated Antarctica below 60 degrees south, weathering the extreme conditions there with no difficulties. For more information on the Aero Rig, see Damon’s blog written when he was with Carbospars – click here. Despite being built twenty years ago, these two vessels are as impressive today as at their launch, with a design emphasis on ease of sailing, safety, comfort and reliability. Because of their very high construction standards, both of these vessels are classed for operating in all oceans. 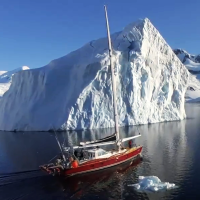 In September 2014 Novara re-crossed the Arctic Circle and officially completed a North-West Passage trip, and both vessels still regularly travel to Arctic and Antarctic waters on tourist and scientific expeditions. At Magma Structures we have been building Dyna-Rigs for the world’s largest sailing vessels. Like AeroRigs, these have the attraction of being easy to handle and very efficient for off wind sailing. On both of the large Dyna-Rig projects Magma Structures has completed to date, each vessel has the capability to furl or deploy all of its sails within six minutes, simply at the push of a button. “The design philosophy for these rigs has not changed. We still focus on making the rigs practical, low-maintenance, reliable, easy to use and efficient. These attributes of the Dyna-Rig mean that owners of vessels with these systems spend far more time sailing than owners of conventional rigged superyachts.” Damon Roberts. 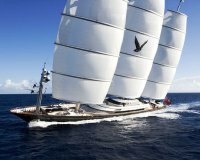 With recent technology advances in electric drive systems, this also means that these large sailing superyachts can now potentially operate completely fuel-free, a key consideration and asset for many modern vessel owners.